However, I won't be providing instructions in this article on how to play Rocksmith with a guitar. That is a pretty straightforward thing. Why hook Rocksmith up to a piano? Soon after I got Rocksmith, and my piano students heard from my guitar students how fun it was to play on guitar, they wanted to play it too. It took some thought and experimentation, but I was able to make it work with one of my digital pianos. If you have an audio output jack on your electric piano, this method may work for you. One note of caution: It may not work well, however, unless you can make your piano sound like a guitar. The following paragraphs and pictures will take you step-by-step through the process. NOTE: This particular method of using the piano with Rocksmith will mostly limit you to playing only three games: Gone Whalin', String Skip Saloon, and Hurtlin' Hurdles. You could play songs, other games, and use other features of Rocksmith if you know the pitches of every string on a guitar and can almost instantaneously convert them to the corresponding pitches on a piano. (A musician who plays both guitar and piano quite well could pull off this feat.) Also, these directions are for the the computer version of the game, not one designed for a game console (such as Xbox). I've never tried this technique with a game console since I don't have one. However, these steps may very well work with game consoles. STEP ONE Connect the plug on the Rocksmith cable to your electric piano. Find the audio output jack on your electric piano. It needs to be a quarter-inch size, but you can buy an adaptor at a Radio Shack or similar electronics store to convert it to the proper size. 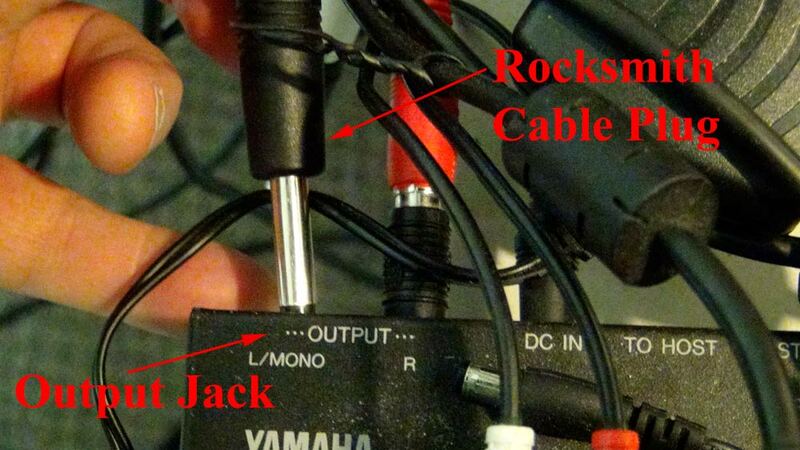 Plug the Rocksmith cable plug into the audio output jack. Most pianos have two of them for stereo - right and left. Either one should work fine. In my case I have my piano keyboard plugged into a sound generator and plug the Rocksmith cable into one of the stereo audio output jacks that also functions as a mono output. Notice in the following picture that the audio output jack I use is labeled "L/Mono". STEP TWO Connect the USB end of the Rocksmith cable to your computer. 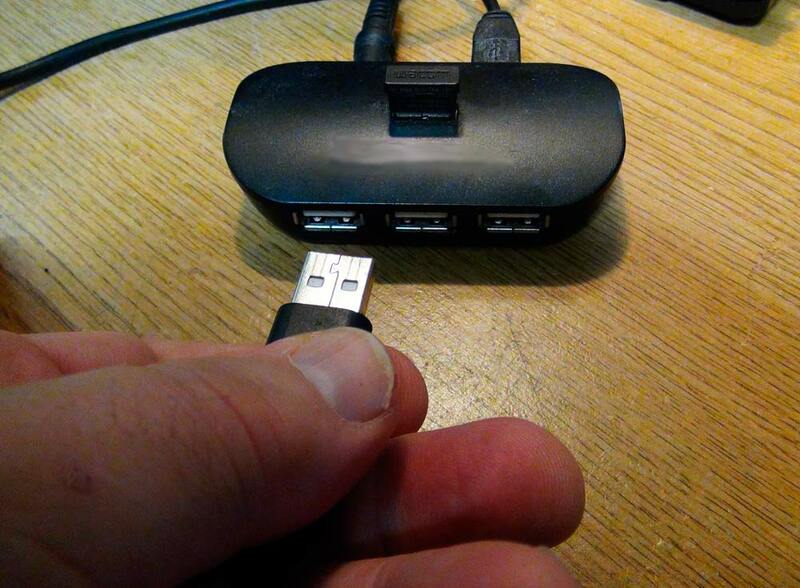 Find an available USB connection on your computer and plug the USB cable into it. STEP THREE Set your piano to sound like a guitar, preferably a nylon string one. Rocksmith works best if you can make your piano sound like a guitar. Your piano may not have this sound but you may be able to find a different instrument sound that may work. It's possible that a piano sound may work, but if I remember correctly from when I first started using my piano with Rocksmith, it didn't work as well. It would "drop" notes: It was sometimes necessary to play a key more than once to trigger the game. Clearly the game was designed for the sound of a guitar, not a piano, so it's understable that this would be important. One of my electric pianos is a midi controller hooked up to a sound generator with about a thousand different sounds - pianos, guitars, wind instruments, brass instruments, percussion, bowed string instruments, even world instruments. So setting that piano to sound like a guitar was a simple process. STEP FIVE Start Rocksmith and follow the directions within the game. Refer to the following guide to translate guitar-specific requests into piano equivalents. NOTE: If you haven't played Rocksmith before you will have to first create a profile and go through some one-time-only steps to get started using your piano with Rocksmith. Guide to Converting Rocksmith "Guitar Speak" into "Piano Speak"
Listed below are some Rocksmith guitar-specific requests and how to duplicate them on a piano. Guitar Tuning - Play the color-coded keys: Sixth string (top string) is red E2 (Eddie), fifth string (5th string from the bottom) is yellow A2 (Ate), fourth string (4th from the bottom) is blue D3 (Dynamite), third string (3rd from the bottom) is orange G3 (Good), second string (2nd from the bottom) is green B3 (Bye), and the first string (bottom string) is purple E2 (Eddie). Play Louder - Play the note louder. 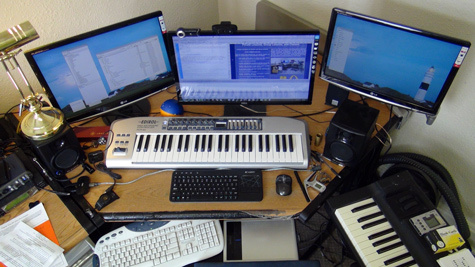 You may have to play several keys at once to get sufficient volume. If you're playing the arcade game "Gone Whalin'" see the notes below. Make Some Noise - Play several keys (they need not be in the list above) in rapid repetition very loudly. You may have to continue doing this for several seconds. Mute the Strings - Don't play any keys and release any keys you are holding down. This may not work very quickly if your piano has reverb or some other effect that keeps the notes ringing for a while after you lift a key (or keys). For the game Hurtlin' Hurdles you may have to stop playing sooner than you expect to duplicate muting a string on a guitar, which is instantaneous because it is plugged directly into a computer (or should be). The game "Gone Wailing" can be played using any keys. To make the "Banana Man" go higher try playing a group of keys together. To make him drop, release the keys. You may be successful making the "Banana Man" go a little bit higher by repeatedly playing only one key, higher yet by repeatedly playing two keys, yet even higher by repeatedly playing three keys, etc. The "Banana Man" goes higher with more volume, and falls with silence - and doesn't rely on specific keys to do this - so you may use any keys you wish. If you just want to play "Gone Wailing" and nothing else, you can skip STEP FOUR entirely. Your Guitar Volume Seems Low - Turn up the volume on the piano (or sound generator if you use one). When the software directs you to tune using the built-in Rocksmith tuner, use the color-coded keys on the piano. They correspond to the pitches of the open strings on a guitar. You should not need to tune anything because your piano should already be in tune. If Rocksmith says your piano is out of tune (that is, a virtual guitar string is out of tune), check for a software option or hardware button on your piano (often located on the back of electric pianos) that will let you set the overall tuning up or down till Rocksmith is happy. If the built-in Rocksmith tuner continues to say you are out of tune no matter what you do, it may be related to the sound or volume of your piano. Try different instrument sounds - guitar is the best of course - but anything that sounds closest to a guitar might work. Try turning the volume of the piano down. If nothing you do makes it possible to fool Rocksmith into thinking your piano is a guitar, I'm afraid Rocksmith may not work with your particular electric piano. Here are some tips for piano teachers who might want to use Rocksmith as a pedagogical and motivational tool. (As both a guitar and piano teacher I use it often, more with guitar students, but also occasionally with piano students.) "String Skip Saloon" can be played by one to six players, making it potentially a great group activity. (When I taught two sisters in back-to-back lessons, this became a favorite and motivational game that they could play together. I generally allowed them to play only if they had completed their method book assignments for the week.) "Gone Whalin' is a good game to help piano beginners learn how to play dynamics. "String Skip Saloon" might help a beginning pianist learn the letter names of the white keys (A, B, D, E, and G only). "Hurtlin' Hurdles" can help piano players learn how to repeatedly play the same key rapidly. It might also be good for a more advanced student who wants to get better at using a repeated sequence of fingers (such as middle, index, thumb, middle, index, thumb, etc) to play a single key in very fast repetition. I'm sure you will find other uses for Rocksmith. I hope you found this article helpful and enjoy playing Rocksmith with your electric piano.